Traditional 38' Bertram sport bridge, Pompanette fighting chair, out riggers, eight rocket launchers, 10 Lee rod holders, retractable cockpit awning, this boat is ready to fish. New stainless steel exhaust risers and SS exhaust 'T's. Economical 3208TA's, some newer electronics, sleeps 6. Owner's stateroom is forward and features a large V-berth, privacy door, hanging locker, two opening ports to insure ventilation, and plenty of storage. Next aft is the guest stateroom with upper and lower berths, table drawers, and locker space. Across and to starboard is the head with seperate stall shower, sink w/hot/cold water, mirrors, vanity, Vac-U-Flush head, and plenty of ventilation. Continuining aft and up two steps is the salon with the galley to starboard. Galley up features include the ability to see 360 and great ventilation, Sub-Zero refrigerator & freezer, hot/cold pressure water, (3) burner stainless steel stove with oven, and more than enough counter space for preparing large meals for the whole family. 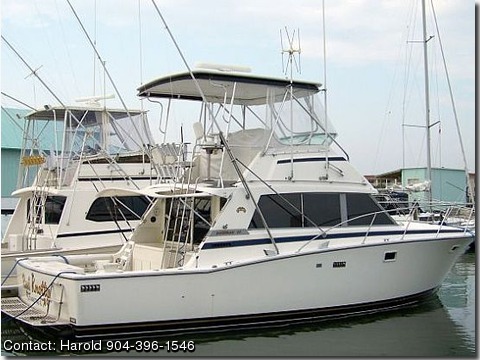 All areas are light and airy with opening ports and two deck hatches, sliding open windows and full forward windshield.